The company line at TCU this week seems to be humility, although in the wake of last weekend’s jaw-dropping, 82-27 massacre of Texas Tech, that isn’t the easiest trick to pull off. How, exactly, does one go about suggesting that an 82-point performance against a conference rival is actually not all it’s cracked up to be? Or that it somehow fell short of expectations? The effect turns out to be less humble than humblebrag. Ah, yes: Those delinquent field goals. On four of their 16 offensive possessions, the Horned Frogs settled for three points rather than seven, always a sign of impending rot. Not only that — on two other possessions, they didn’t score at all! What kind of offense only manages touchdowns on two-thirds of its chances? One with room to improve. All right, we get the gist: Good teams don’t stand around marveling at their own box scores, especially in the vicinity of tape recorders. And anyway, Texas Tech has a well-deserved reputation for fielding the most flammable defense in the Big 12 (or just about anywhere else), having previously been torched this season in losses to Arkansas (499 yards, 49 points), Oklahoma State (528 yards, 45 points), Kansas State (535 yards, 45 points), and West Virginia (550 yards, 37 points). For any Big 12 offense worth its salt, sending the Raiders back to Lubbock covered in blisters is another day at the office. Now no. 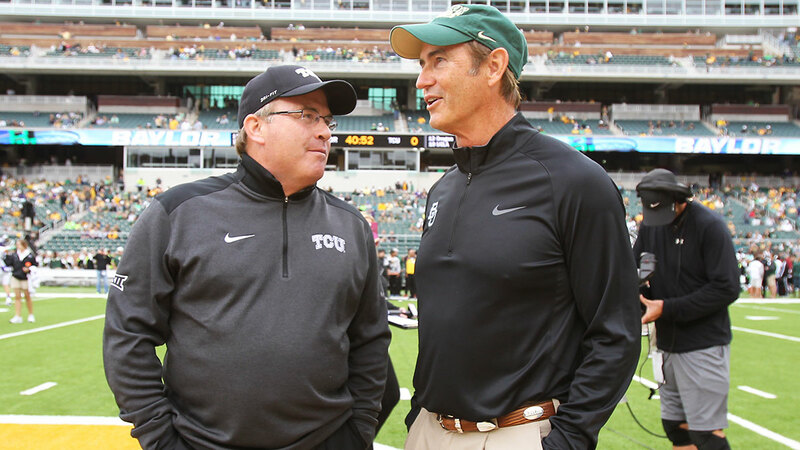 7 TCU’s attention is focused squarely on this weekend’s trip to no. 20 West Virginia, and after that on a November 8 visit from no. 9 Kansas State. There’s no time to dwell on the past, and there’s still a lot of football left to be played, and there are still many bland clichés to recite. Whether they can afford to acknowledge it, though, the Horned Frogs’ offensive awakening is one of the emerging marvels of the 2014 season, and not only because of one prolific afternoon at the expense of a demonstrably bad opponent. In 2013, the Frogs scored just 10 points against Texas Tech en route to what would turn out to be their first losing season since 2004. Through seven games this year, the revamped offense has already scored more points (353) than it did all of last season (301), and it’s only picking up speed: In October, the Frogs hung 37 points on Oklahoma, 58 on Baylor, and 42 on Oklahoma State in successive weeks before their untrammeled romp over Texas Tech, giving them the highest-scoring attack in the nation at 50.4 points per game.1 In the same span, they leaped from the fringes of the polls onto the short list of viable national contenders. At 6-1, TCU is the Big 12’s highest-ranked team in both traditional polls, as well as in the initial rankings released earlier this week by the committee charged with selecting four teams for the inaugural College Football Playoff. At this point, it looks like the conference’s best chance of making the cut. But lest we forget, Patterson is, and on some level always will be, a defensive coach. He played linebacker and safety at Kansas State, spent the first half of his career as a journeyman defensive assistant, and arrived at TCU in 1998 as a defensive coordinator under head coach Dennis Franchione. Since Patterson rose to the top job in 2000, his best teams have always been defined by defense: In the ensuing decade, the Horned Frogs led the FBS in total defense four times,2 including a three-year run at the top of the rankings from 2008 to 2010 that coincided with three consecutive top-10 finishes in the AP poll. The 2010 team clinched an undefeated season by holding the Big Ten champion, Wisconsin, to a season-low 19 points in the Rose Bowl. In the same span, TCU also boasted a future NFL starter at quarterback, Andy Dalton, who ranked among the most efficient passers in the nation in 2009 and 2010. But quality never had much bearing on quantity: In 26 starts over those two seasons, Dalton only attempted 30 passes in three of them, and only exceeded 300 yards passing once. (Even on that occasion, a 47-7 trouncing of Utah in November 2010, the excess was hardly necessary.) 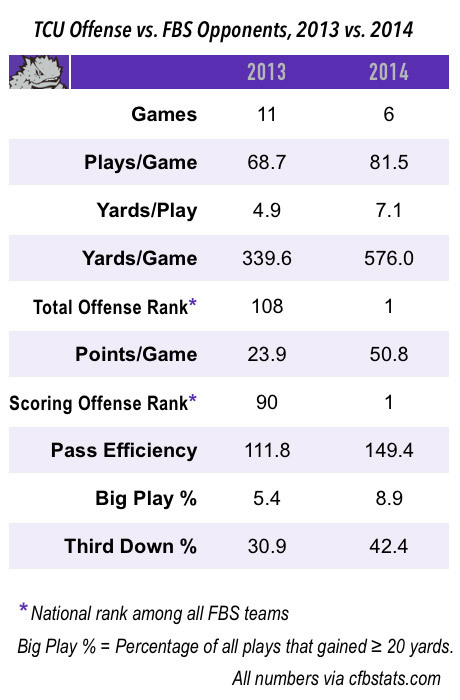 Patterson’s orientation toward the offense in those years was indistinguishable from Nick Saban’s — run first, manage the clock, don’t screw things up for the defense — and his win-loss record was slightly better. In hindsight, the first sign that the outlook wouldn’t last came during the first game of the 2011 season, when the Horned Frogs were eviscerated for 564 yards in an eye-opening, 50-48 loss to Baylor that snapped a 26-game regular-season winning streak. By December of that year, the upset had been recast as the launching point of Robert Griffin III’s out-of-nowhere Heisman campaign; three years later, it looks like the first notice of Baylor’s impending rise as a perennial offensive juggernaut. At the time, though, the final score was most striking for what it suggested about the vaunted TCU defense: Suddenly, the Frogs were as vulnerable to the up-tempo spread attacks that had taken root across the state of Texas as everyone else. Since that night, they’ve allowed at least 30 points in 13 games, losing 10 of them. Still, despite the occasional lapse, by the end of last season it was impossible to pin TCU’s slide to the bottom half of the Big 12 standings on the decline of the defense. In fact, while falling well short of the bar set in its Mountain West heyday, it was clear on paper that the Horned Frog D had adapted to their new environment quite well: In conference games, the Frogs led the Big 12 in total defense in 2012, and they paced the conference again last year in both yards per game and yards per play allowed, ranking first and third in those categories, respectively. They also led in both seasons in run defense and yards per carry allowed, and forced a Big-12-best 60 total takeaways over the two years. In a league committed to making every defense look vulnerable from time to time, if not all the time, no one was playing better defense than TCU. The offense, on the other hand, was looking increasingly miserable. In 2012, the Horned Frogs lost starting quarterback Casey Pachall to a midseason arrest for DUI, and subsequently failed to top 20 points in five of their last six games en route to a disappointing 7-6 finish. Last year, Pachall was in and out of the lineup with injuries, and didn’t make much difference when he was in; the Frogs struggled to establish any semblance of identity or consistency and finished ninth out of 10 teams in conference play (ahead of only Kansas) in total offense, scoring offense, and pass efficiency. In rushing offense, they finished dead last. At times in 2013, the offense seemed to slip into hibernation for entire quarters. At other times, it seemed intent on shooting itself in the foot. In the season finale, a 41-38 loss to Baylor, the offense undermined an otherwise encouraging effort against the eventual Big 12 champ by committing four turnovers, two of which were returned directly for Baylor touchdowns; another giveaway set up the Bears offense for an easy score at the TCU 1-yard line. After that game, Patterson angrily lectured his Baylor counterpart, Art Briles, on “class,” ostensibly because a Baylor player who had been ejected on a targeting penalty had been allowed to remain on the sideline briefly before leaving.3 But in the heat of the moment, there was no way to separate Patterson’s anger at Baylor from his frustration with his own team. With no bowl game on the horizon, Patterson immediately went about overhauling his offensive coaching staff, beginning with demotions for co-offensive coordinators Jarrett Anderson (now the offensive line coach) and Rusty Burns (now in charge of outside receivers). For their replacements, Patterson looked to a pair of in-state rivals for assistants with roots in the Air Raid: Doug Meacham, who had just spent his first season as the primary play-caller at Houston after eight years on Mike Gundy’s staff at Oklahoma State, and Sonny Cumbie, a Texas Tech assistant who, as the Red Raiders’ starting quarterback in 2004, had engineered a 70-35 blowout over Patterson’s team. In the spring, TCU recruited Johnny Manziel’s former backup at Texas A&M, Matt Joeckel, who had two years under his belt in an Air Raid system and would be eligible to play immediately as a graduate transfer. Patterson, the old defensive hand, was all in on a system that placed little or no value on establishing the run, winning time of possession, or occasionally easing up on the throttle for the sake of the defense. The skepticism began with the incumbent quarterback, Trevone Boykin, a redshirt junior with little to show for his 16 career starts under center. Boykin spent most of his sophomore campaign “maximizing his versatility,” which meant shuttling between quarterback when Pachall was injured, wide receiver when Pachall was healthy, and spot duty in the Wildcat. But he attempted just six passes in the last five games, and finished with a subpar 115.3 efficiency rating against FBS opponents. When coaches decided to pursue Joeckel, the writing for Boykin’s immediate future as a quarterback seemed to be on the wall. Instead, Boykin quickly separated himself on the depth chart, found his comfort zone in the new system, and has looked more confident with each passing week. In October, Boykin put the ball in the air nearly 41 times per game — a number Dalton could have barely dreamed of four years ago — and connected on an FBS-best 13 touchdown passes against one of the toughest schedules in the nation in that span. (The gantlet of no. 4 Oklahoma, no. 5 Baylor, and no. 15 Oklahoma State pitted the Horned Frogs against three top-15 opponents in as many games, although all three teams have since fallen in the polls — or out of the polls altogether, in Oklahoma State’s case — following subsequent losses.) Seven of those 13 touchdowns came against Texas Tech, but seven also came from at least 35 yards out, and Boykin’s average completion for the month netted a whopping 16.7 yards. Combined with the increased tempo,4 the overall yields have been prolific beyond anyone’s wildest projections, Patterson’s included. Against FBS defenses, TCU ranks no. 1 nationally in total offense, no. 5 in passing offense, and no. 5 in yards per play. Among Big 12 teams, TCU’s ground game, the second-worst in the league in 2013, ranks second in rushing yards per game this year behind only Baylor, and first in yards per carry. Boykin’s efficiency rating is up by more than 30 points over his sophomore effort, and his outrageous stat lines the last two weeks against Oklahoma State and Texas Tech have made him the most recent (and most unlikely) entrant in the Heisman horse race. The irony, of course, is that a coach who built his reputation with defense is in the process of rebuilding with a system that tends to put his defense at a distinct disadvantage against similarly gonzo offenses. Baylor, still the most gonzo attack of them all, ran an astounding 109 plays against TCU in the Horned Frogs’ only loss, racking up 782 yards of offense and erasing a 21-point fourth-quarter deficit by scoring 24 unanswered points in the final 11 minutes, which likely would not have been possible if TCU hadn’t continued to push the tempo late. The previous week, Oklahoma scored 33 points on 461 yards, the highest point total the Horned Frogs have overcome in a non-overtime victory since joining the Big 12. For the season, TCU has fallen from no. 1 in the conference to no. 6 in total defense against FBS opponents, and from no. 1 to no. 8 in yards allowed per conference game. But the defense has had its moments, most notably holding Oklahoma State without a touchdown — Oklahoma State! — in a thorough, 42-9 blowout that showed both sides of TCU ball at its best. Before that game, OSU had reached the end zone at least twice in 58 consecutive games dating back to 2009. And even against Baylor and Oklahoma, the TCU defense helped offset some of the damage by forcing a combined five turnovers, two of which it returned for touchdowns. Still, on the whole Patterson seems to have made his peace with the logic of the spread revolution, which is more akin to the logic of a basketball game than to the traditional, trench-warfare logic of ball control and field position: Every defensive stop is magnified, regardless of the field position, and every field goal qualifies as a stalemate, at worst.5 Earlier this week, Patterson was asked about defending West Virginia, yet another up-tempo Air Raid attack that’s averaging 505 yards and 35.6 points in Big 12 play, and his response made no pretense of expecting to prevent the Mountaineers from moving the ball. In this kind of game, some bending is inevitable; the difference will be which side is able to keep from breaking more often. He didn’t go on to say If you can’t beat ’em, join ’em, or anything to that effect. At this rate, though, his offense is speaking quite well for itself. In 2013, TCU scored 61 points in the entire month of October. TCU also finished no. 2 in total defense in 2006. 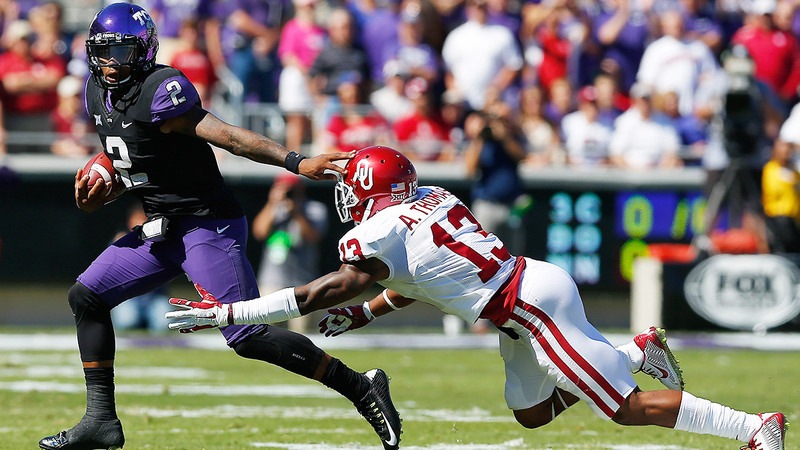 Patterson also mentioned that the player in question, All–Big 12 safety Ahmad Dixon, had been charged with misdemeanor assault earlier in the season. TCU is averaging 83.6 plays per game this year, about 15 more per game than in 2013. Cousin Sal’s Week 9 Prop Bets!